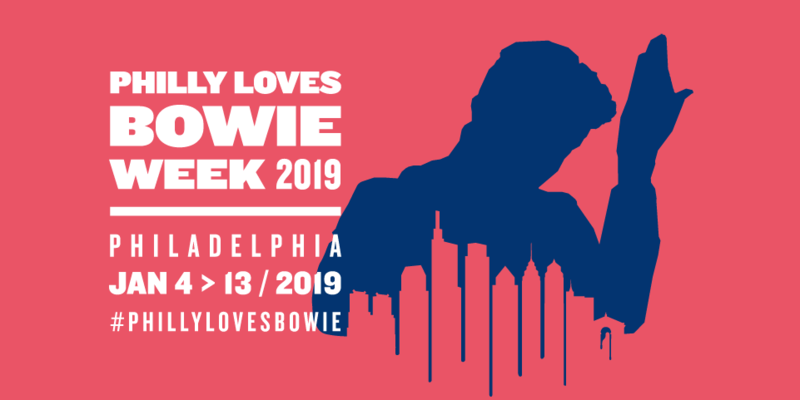 Thanks to everyone who submitted a logo design for Philly Loves Bowie Week: January 4-13, 2019 … such creative spirits out there! Our winner has been selected and notified (and is naturally quite excited) – and we’ll be rolling out their name and the new #PhillyLovesBowie logo – along with other 2019 details later in October… stay tuned!! As we work planning out Philly Loves Bowie Week: January 4-13, 2019 — ten days of events and activities celebrating David Bowie and raising awareness and monies for the Cancer Center at CHOP in David’s memory — we are reaching out to those Bowie fans with an artistic touch! CREATE OUR 2019 LOGO FOR PHILLY LOVES BOWIE WEEK! Each year our logo is created by a Bowie fan. The logo is used on social media and we also create commemorative pins and magnets to sell during the week, with 100% of the proceeds going to the Bowie Fund, earmarked to support the Cancer Center at Children’s Hospital of Philadelphia … since the first Philly Loves Bowie week, we have raised $23,000 for Children’s Hospital of Philadelphia‘s Cancer Center. OK – so what do you win? Aside from the fame/glory of being the one who helps us spread the good word, we’ll award you the VIP experience to see Donny McCaslin Group coming to The Foundry at the Fillmore Philadelphia on September 11. As you know, Donny’s saxophone helped define the visionary stylistic fusion that is BLACKSTAR, David Bowie’s final album. Now, two and a half years after BLACKSTAR’s release, McCaslin returns with a new album – Blow – and a new definitive statement that fully realizes Bowie’s influence and McCaslin’s evolved artistic direction. The winning logo design will get two tickets to the show, a VIP experience with a signed CD and poster and exclusive access to the sound check. They will also receive four tickets to our Night of Stardust concert in January as part of Philly Loves Bowie week. You must be 18 years of age or older to submit a logo design. Design submissions can be one, two or full-color. Design submissions need to be submitted as either a jpg or png attachment via email by August 31, 2018 at 11:59pm. Be sure to include your full name and let us know what Bowie means to you!